Does sustainable consumption spell the end of business as we know it? Not necessarily, but it does challenge the growth paradigm on which our local and national economies are based. 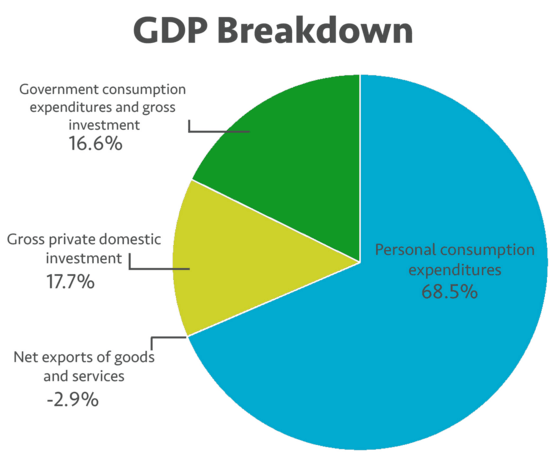 In the US, roughly 70% of Gross Domestic Product (GDP) comes from household consumption so it’s no surprise that economic policy is rooted in boosting consumer spending. But continued growth of this kind requires an ever-increasing stream of energy, minerals, timber, water and other natural and made-made material goods. Relying on continuous growth is fundamentally at odds with the limited resources available on our finite planet. This reliance on economic expansion through consumerism also produces inevitable boom-bust cycles, which hurt the hardest the working middle- and lower- middle classes, and the poor. The slow recovery from the 2008 Great Recession has shown that the benefits of the recovery went mostly to the very top earners, living wage jobs declined, and wealth inequality increased. The political mantra of the past 35 years that growing economy, as measured by GDP, is a tide that lifts all boats has been thoroughly debunked. Tim Jackson delivers a compelling challenge to established economic principles, explaining how we might stop feeding the crises and start investing in our future. Organizations such as Regenerative Finance, The Next System Project, New Economics Foundation, and the Democracy Collaborative are responding to the call for a better economic model, offering both theory and real world examples of alternative economic and business models that minimize environmental impact and build fair, inclusive economies. Kate Raworth presents her "doughnut" model and explains how economics can help us reach an environmentally safe and socially just space for humanity. Explore whether countries are reaching the safe and just space at A Good Life for All Within Planetary Boundaries. Won’t sustainable consumption be bad for local economies? Changes in consumption patterns will likely have an impact on local retail sales and tax revenues. But there can also be economic benefits from new types of production and exchange, some of which are already emerging in our communities. The broader systemic changes discussed here can help build more resilient local economies and provide new business opportunities  as well. See Responses to Common Concerns for a fuller discussion of this question. What type of change is needed and what does that look like in our local economies? Businesses that contribute to a “service-enterprise” economy. Local businesses should deliver services, as opposed to increasing the throughput of materials products, for meeting basic needs (nutrition, health, shelter) as well as improving the quality of lives: social care, education, leisure, recreation, protection of natural systems. Company structures that serve the interests of the community include B-corporations, co-ops, and community interest companies. Changes in work and employment. Expand employment through 1) shifts to more labor intensive sectors (e.g. care, craft, and culture) and 2) sharing available working hours to achieve a just distribution of working time. Local investment for future prosperity. Local investment portfolio should include 1) improving energy and resource efficiency, 2) increasing capacity for a local service-enterprise sector, 3) developing community assets (public spaces), 4) protecting and enhancing ecological assets (green spaces), and 5) developing local renewable energy resources. Local lending. Support local institutional innovation such as community banking, peer-to-peer lending, community bonds, and local exchange trading schemes. Elephant in the Boardroom: Why Unchecked Consumption is Not an Option in Tomorrow’s Markets. World Resources Institute (WRI), 2017.